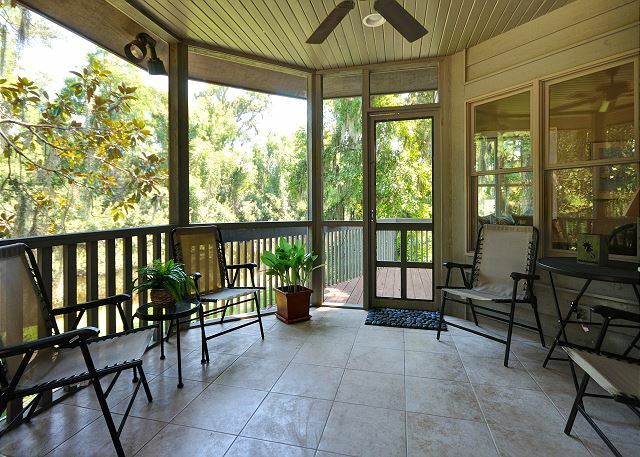 Welcome to the BESTNEST at 40 Shell Ring Road in Sea Pines. 40 Shell Ring features hickory flooring and NO carpet. The kitchen is completely renovated with maple cabinetry, granite counters, and all new cookware, equipment and stainless appliances- even a built in wine cooler. The dining area seats eight comfortably with another four barstools at the kitchen island. The living area features built in entertainment center and HD TV/BluRay/Netflix. 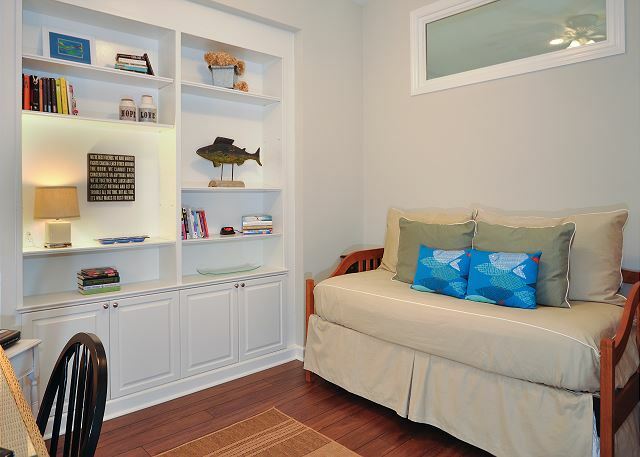 The main level master (king) is spacious and features wall mounted TV. 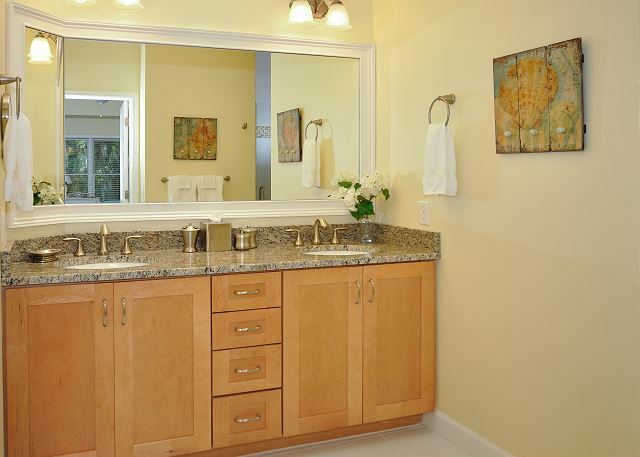 The en-suite bath features double vanity and walk in shower. Two additional bedrooms upstairs (one queen, two twins) share a full bath with tub/shower combination. There is also a den with desk space for working or surfing, and features a full bath and room for clothes and 'stuff'. The bed is a twin with trundle. There is a new gas grill for cooking out with easy access to the kitchen doorway and a spacious 2-car garage is ideal for parking vehicles or all of your garb. 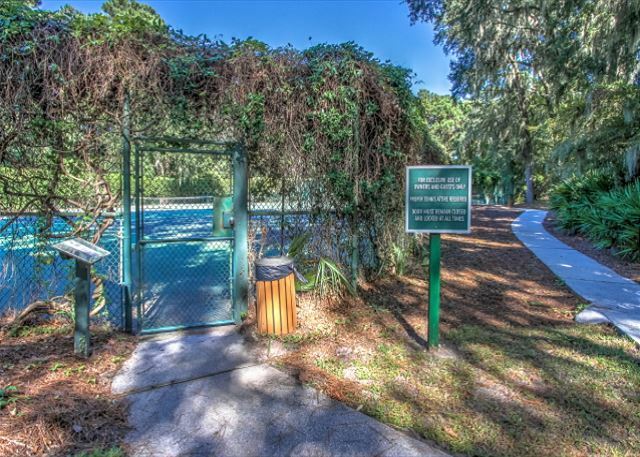 POOL/TENNIS: Complimentary at the neighborhood facility; 3 minute walk. Pool open April - September (not heated). Location perfect. house well supplied and very clean. This was our second stay in a Beverly Serral property and both have been great. 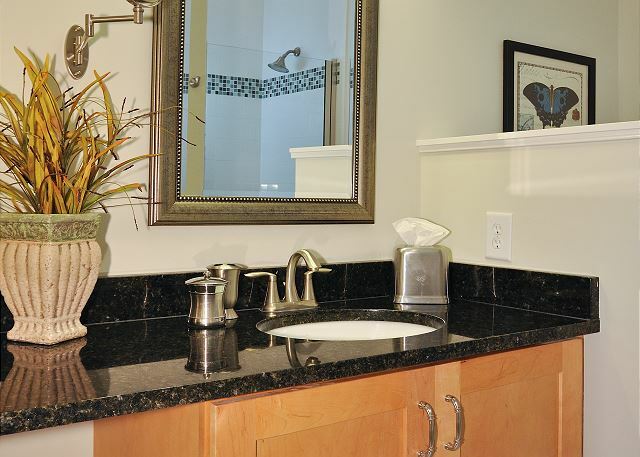 I like having peace of mind that a property we rent will meet consistent standards for condition and cleanliness, and they provided things like soap, paper towels and garbage bags that are not included with evey rental. The basket of snacks waiting on arrival is also a nice treat! 40 Shell Ring is spacious and provided plenty of room for 2 adults and 4 teenagers. The kids took the two bedrooms at the front side of the house, and had two full bathrooms to use between them. We didn’t use the daybed/trundle bed in the den, but it does allow some flexibility in sleeping arrangements or room for 1-2 more people. The kitchen is nice and well equipped, and this property has a garage that we used for storing bikes and beach items. 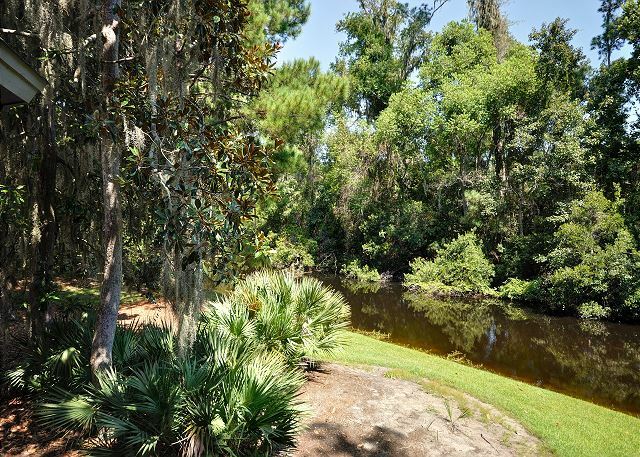 The house is located not far from the entrance of Sea Pines, which is convenient for access to stores, restaurants and attractions outside of Sea Pines but not as centrally located within Sea Pines itself. There is a bike path just outside the neighborhood entrance that can be used to get all over Sea Pines. The beach club is a short drive (5-10 minutes) and parking was not an issue with it being off season. There is a repaving/construction project on the main road when you first get into Sea Pines that I believe is scheduled to be complete by November. There are some road and bike path closures at the entrance of the neighborhood as a result which didn’t really negatively impact our stay, just some detours to deal with. Overall we really enjoyed 40 Shell Ring and would stay again! Filled with laughter, fun and the perfect rental! We always love having the Henrys! The home was beautiful, VERY clean and just a gorgeous environment. House was beautiful, super clean and had everything needed for a perfect Christmas week. Can’t say enough good things about rental and can’t wait for a return visit to a Beverly Serral property. 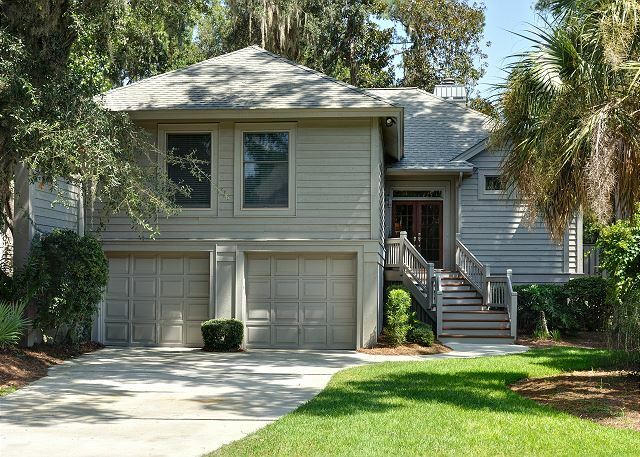 This home was perfect for our family vacation to HHI! The owners/management have truly thought of everything that a family could need during their stay. The house is beautiful, and the location on the lagoon was so amazing for nature watching! The pool and tennis courts are right down the street, and were not crowded at all. We could ride bikes or walk down to the nature preserve entrance or down to visit the horses at Lawton. Sea Pines Beach Club was a great set up for beach days, but is definitely a bike or car trip. Beverly Serral renting is amazing compared to all of the other experiences we have had. We have been coming to HHI for 15 years now, and this was the easiest, most efficient, and most up-to-date (love the app!) way that we have booked/checked in and out. Thank you for sharing this home with our family! We have made very special memories again at HHI, and will definitely use Beverly Serral for all of our future HHI Rental needs! Our first experience with BSSR was absolutely wonderful - easy online reservation, quick responses to inquiries before our arrival and during our stay, incredibly stocked kitchen/bathrooms/bedrooms and detailed instructions/recommendations regarding anything and everything pertaining to the rental property and community. Use of the garage bays was a nice bonus. Property a little removed from the rest of Sea Pines and the beach but made for lots of quality bike riding for us. Backyard basically off-limits due to small size and alligators - not considered problems for our group. 4th bedroom is small, has a trundle bed and glass doors - which was generally OK for our 10 and 12 year-old sons - but lack of privacy could be a problem for others. Bottom line - everything exceeded my (and our group's) expectations. And I have wickedly high expectations! Once again, we were thrilled with our Beverly Serral vacation. No detail is omitted to make us comfortable and ensure that we had everything we needed. Beverly Serral thinks of EVERYTHING! This home has plenty of room for everyone! GREAT RENTAL!!! I would never stay in a home that was not a Beverly Serral home…Our familly is totally spoiled! It's worth every dime! We felt like hurricane Mathew would ruin our trip this year. Beverly Serral associates could not have been more accommodating at a difficult time. We had a great week and loved the house. Our new favorite. Very clean and well equipped and great design features. We had a wonderful time there at 40 Shell Ring, I didn't realize that it was not accessible to the beach. I had looked at so many houses, but I thought it was within walking distance to the beach. We rode up there and there was no parking,but we still enjoyed ourselves. We ordered bikes and went bike riding two days. We met our neighbors who were really nice people took pictures for us and even took a selfie. We did have an alligator come up out of the lagoon while we were there. That was a little unsettling seeing that there was not a fence to separate us from the "gator". For the most part it was a great time there. Would do it again. 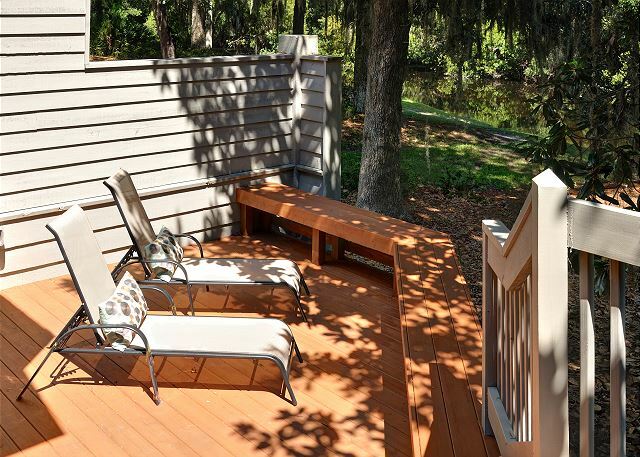 Another lovely year with a Beverly Serral property! This is out third time staying at one of the Beverly Serral signature rentals, and it just keeps getting better. This home was absolutely spotless, equipped with everything we needed, and the beds were super comfortable. The view from the back porch was so enjoyable and relaxing; we loved watching the wildlife and listening to nature. 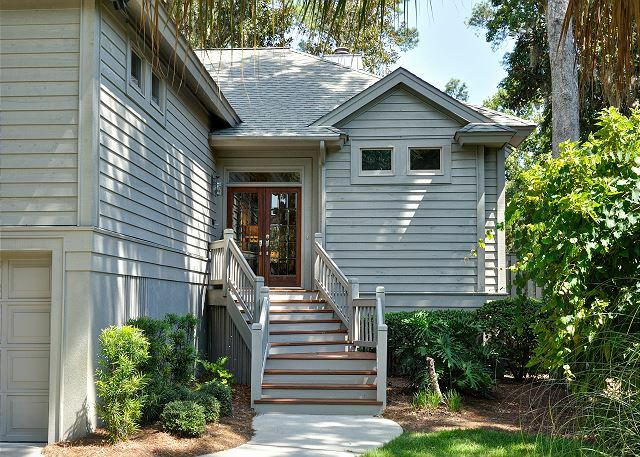 We always stay in Sea Pines, and this home had a wonderful location, just past the gates. We were a quick drive to the Beach Club, and a quick drive up to our usual haunts just outside of sea pines. We happened to be staying here when tropical storm Hermine rolled in, and I'm so glad that we had such a comfortable and welcoming home in which to spend the day. Happily, we even found a draw stocked with flashlights and batteries, and candles in the pantry. They've really thought of everything! 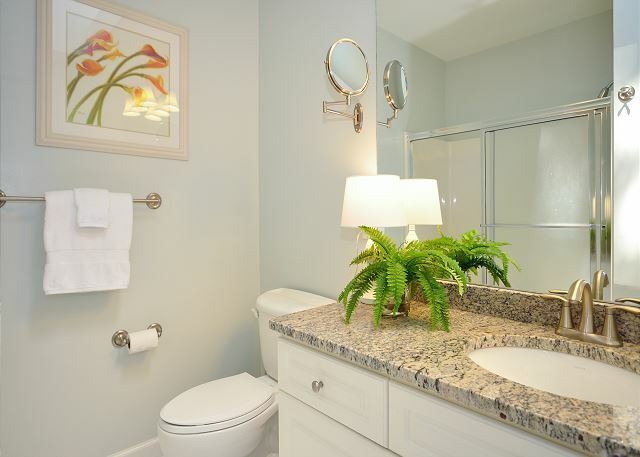 Once you stay in one of Beverly's rentals, you simply won't settle for staying anywhere else on Hilton Head Island. We had a wonderful stay! All the extras were so appreciated! You had to bring clothes and bathing suit and that was all! household items were provided in ample quality and a nice benefit. The staff was helpful every time contacted. We had no issues with any aspect of our experience . Plan on renting again from you. Second time staying at this home. We are just so comfortable in this home. The home is always spotless and everything in working condition! Like having the use of beach towels, chairs and coolers. Neighborhood pool is a big plus also. 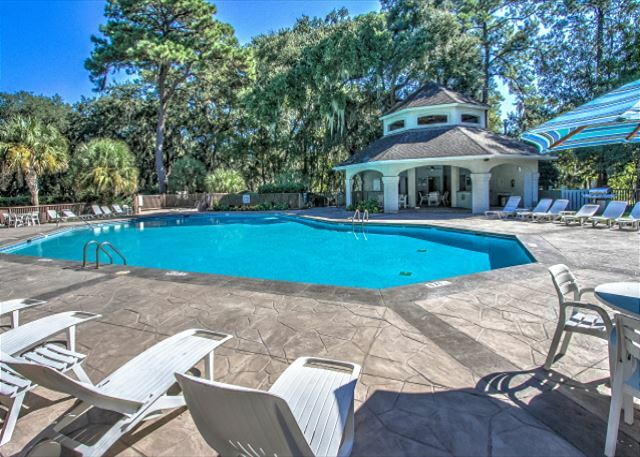 Sea Pines is an amazing place to just relax and unwind. Ride your bikes to the beach, sit by the (usually very quiet) pool, play a few rounds of tennis on your (private) tennis courts... the house is perfect for a family... plenty of room, with an open plan for large dinners and fun. Thanks so much Kimberly! 40 Shell Ring is a very comfy home and we are sooooo glad you enjoyed time with your family. Absolutely a spotless and beautiful home! We were able to truly relax since everything was already clean and top-notch quality. We also loved the layout! It was perfect for our group. We also can't say enough about Beverly Serral and her staff! They are all truly professional, kind and extremely helpful. We are more than happy to recommend this property! Excellent experience. Beautiful yet comfortable house. Lots of thoughtful touches. Hope to stay again next year! It was a fanstastic vacation and the rental home more than met my expectations. Excellent home and location. Second experience living in a Beverly Serral Signature Rental in the same community and we loved both. 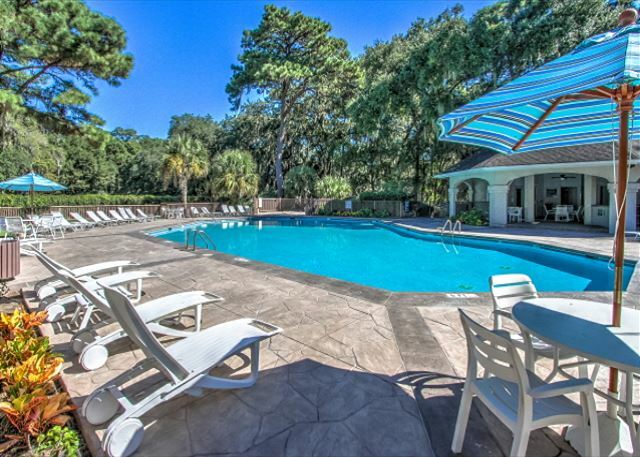 We have stayed at 2 different locations in Sea Pines,with Beverly Serral Rentals and you could not ask for a more relaxing getaway. They are always clean and we'll maintained. You will be completely taken care of when you stay at one of these properties. It was so nice to come into our vacation rental and have such a clean and beautiful home. The house was beautifully decorated and very well supplied with everything we needed. I loved not having to bring the usual things you need like trash bags, soaps, extra toilet paper and paper towels, etc. Clean, comfy, cozy. Our mini schnauzer liked it better there than home. The best rental home we ever had. Very clean and felt like we were at home. Nice quiet neighborhood. Would recommend staying here. It's a place would definitely stay again. First and foremost Beverly and her staff were outstanding. They truly go way above and beyond for their guests. 40 Shell Ring was the perfect get a way for our stay in Sea Pines. 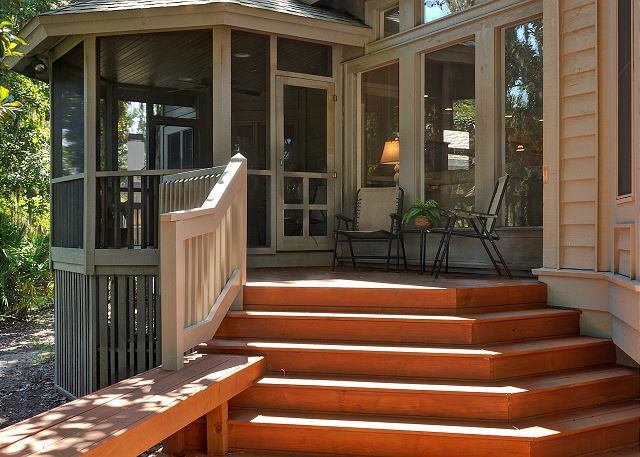 Everything you can possibly need for a beach vacation is provided in this beautiful home. We will definitely return!